I have done loads! I've filled in all the background "spikes", I've also finished the purple background and started the pink strip. 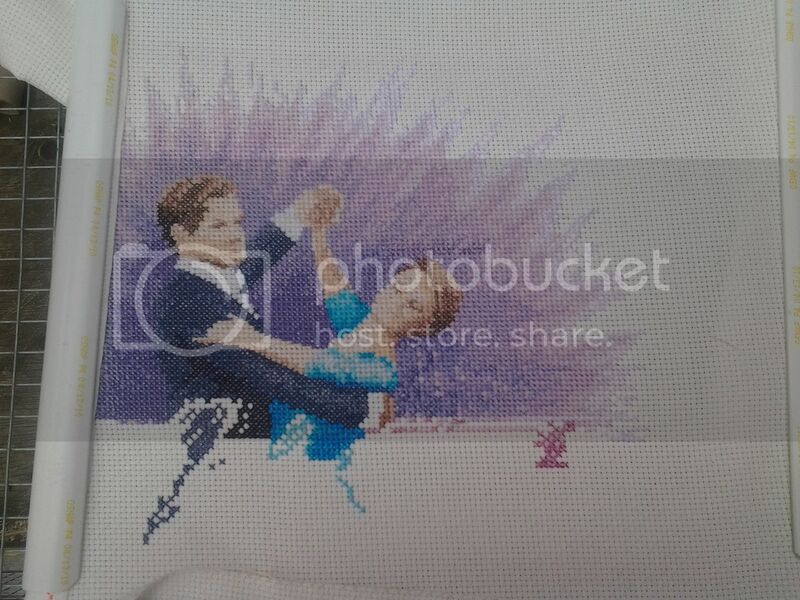 I've stitched a little of his leg and added more to her dress, along with filling in any gaps I had. Let's hope future updates will be as successful and I'll have this done in no time! Lovely! You have done a lot, the image is looking really dense and vivid now. Developing nicely. And definitely the sort of thing you want finished so you can put it on the wall and enjoy it! Coming along very nicely, Wendy. Lots of progress. that background is really stitch intensive! Looking beautiful - love the pose and tbe colour of her dress. It's going to look great! The more I see it, the more I am loving it!! Great progress!! That is going to be AMAZING when it's finished - holy smokes! Oh dear - you have reminded me of the unfinished counted cross stitch projects languishing in my studio - in my defence I was seduced over to the dark side of quilting! This looks lovely - I am looking forward to seeing how it progresses! Another pretty design, looking lovely.